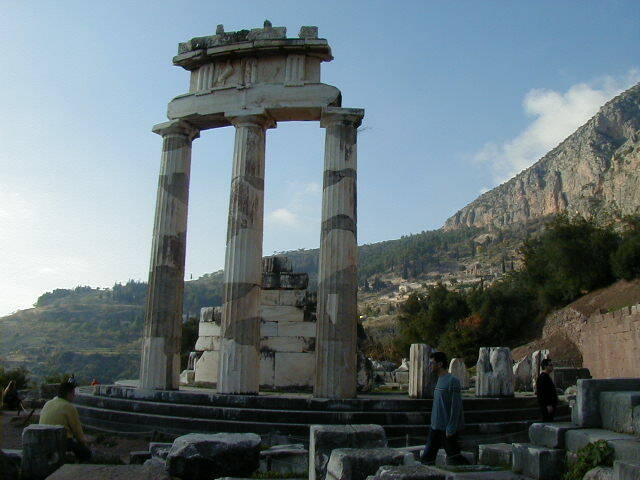 Delphi is only three hours from Athens by bus; I arrived late afternoon on 2 December. I got a room at Hotel Pan Pythia for 9000 drachma, a little over $20. 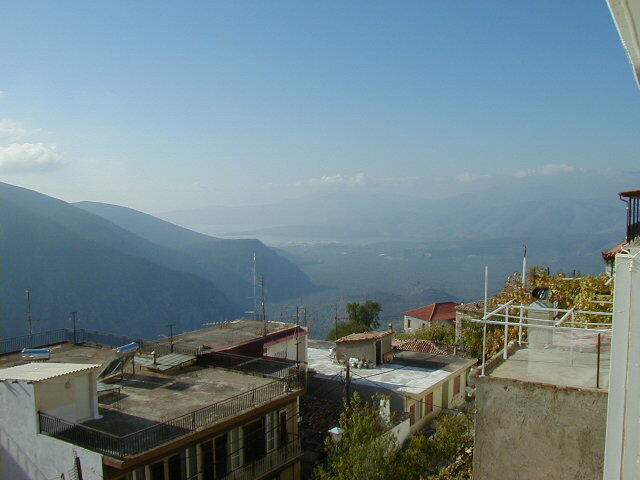 It was a small room, but in the morning I had a beautiful view of the mountains and Gulf of Corinth from my balcony. 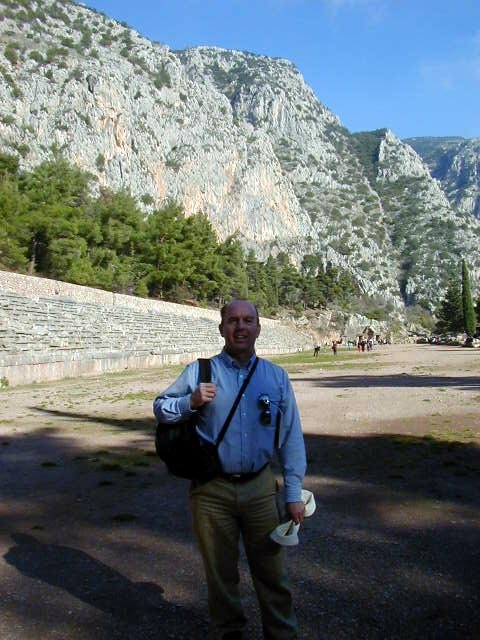 Ancient Delphi is about a mile from modern Delphi. 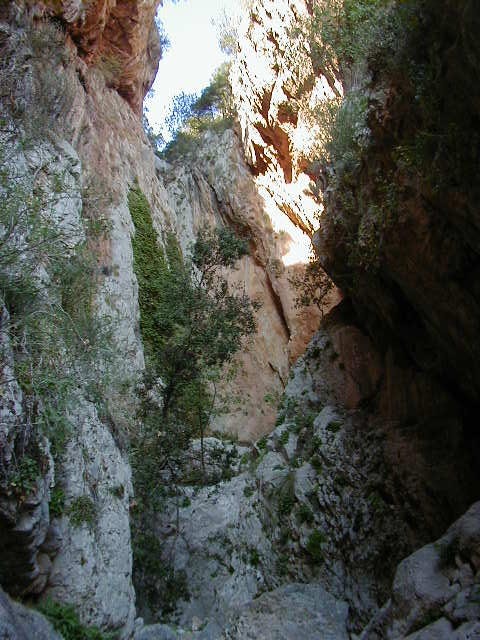 The place was considered sacred by Neolithic people and the Mycenaeans before the Greeks arrived. 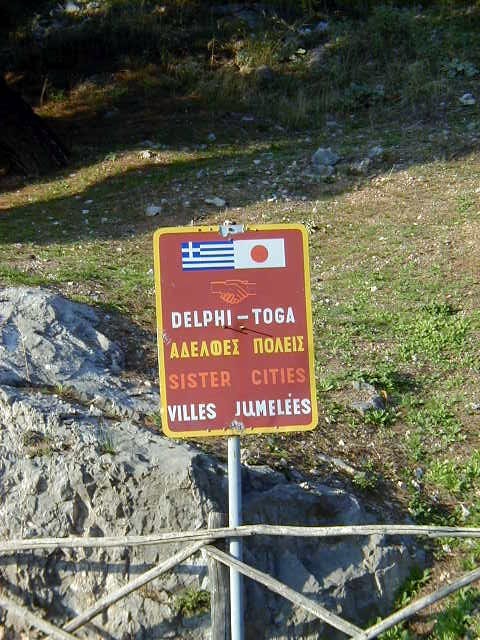 They associated Delphi and the nearby spring with the Earth/Mother Goddess Ge. 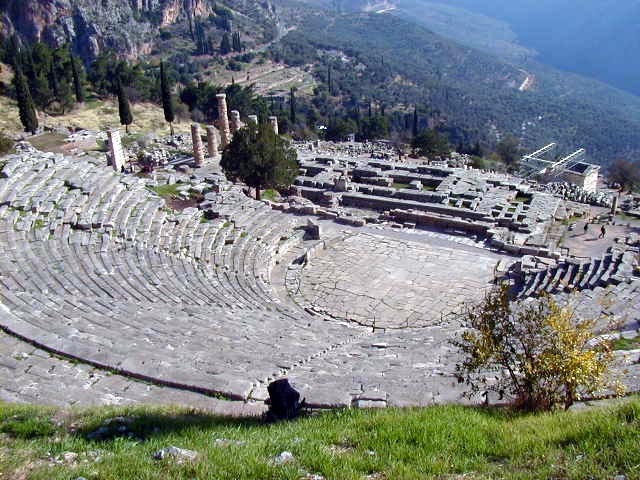 The mythology evolved to make it a place sacred to Apollo, with the Oracle being his spokeswoman. 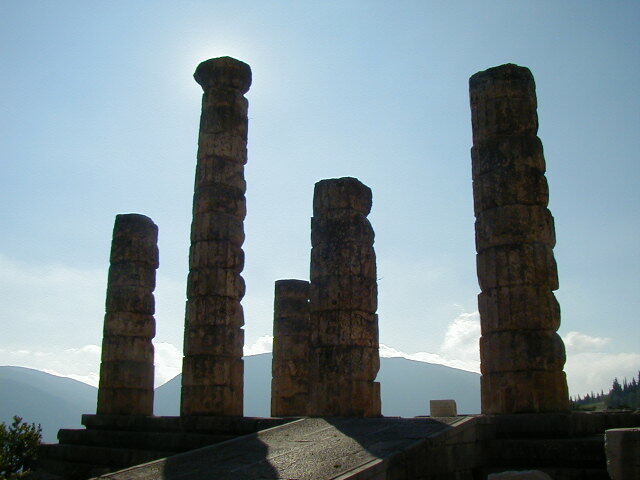 The Temple of Apollo was built over a vent releasing toxic gas from the earth. The location of the vent has not been found. The Oracle would go to the vent, breathe deeply, and go into a fit. A priest would interpret the gibberish the Oracle spoke during this fit into ambiguous prophesies. A donation was expected for this service, and the more important the question asked of the Oracle the larger the donation expected. People facing decisions regarding marriage, business, war, and other issues would consult the Oracle. 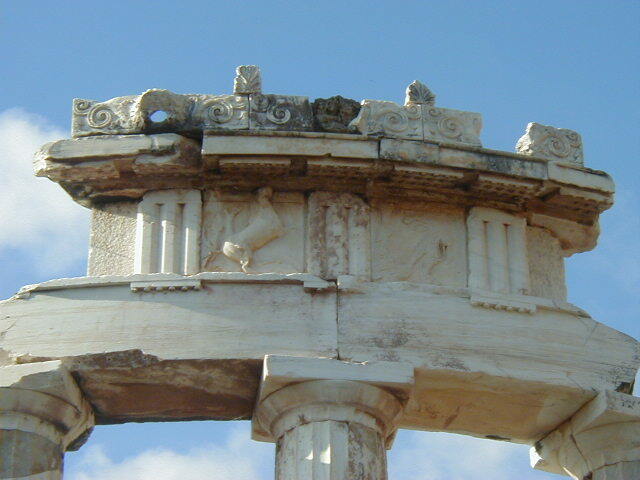 The Oracle and other pagan practices were abandoned in the fourth century A.D. under pressure from the Christians. The temple and surrounding complex was abandoned and time, neglect, and earthquakes buried everything. 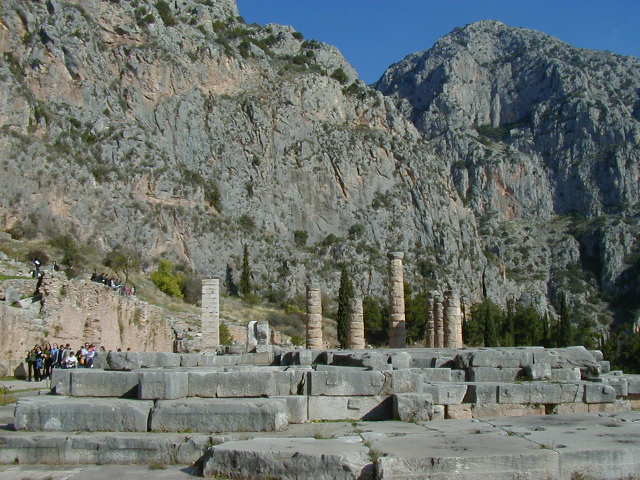 Some pictures from Delphi--the Athenian Treasury, where contributions to the Oracle from Athens were kept; a view from Delphi towards the nearby Sanctuary of Athena; the Athenian Stoa; and Sibyl's and Leto's Rocks. 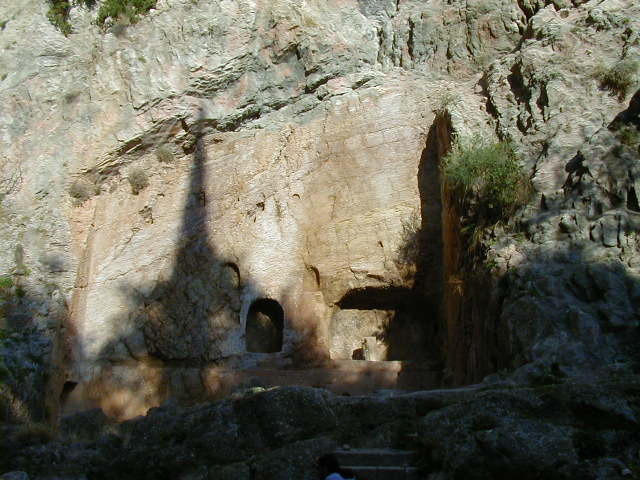 Sibyl's Rock is on the left, it is where the original Sibyl (Prophetess) pronounce her oracles. 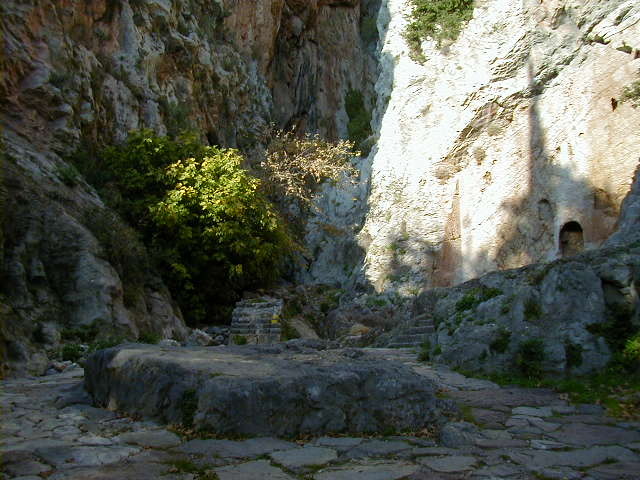 Leto's Rock is on the right, it is where Apollo's Mother Leto stood with the infant Apollo and urged him to kill the Python, the dragon guarding the nearby sacred spring. Talk about a demanding mother! 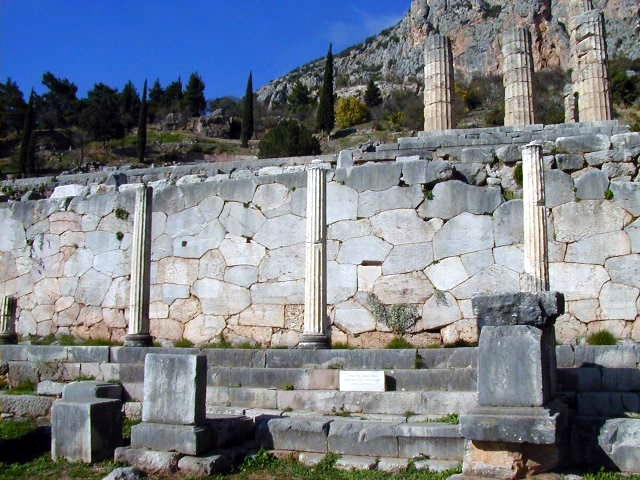 Continuing the tour, all that is left of the Temple of Apollo are a few columns and the foundation. 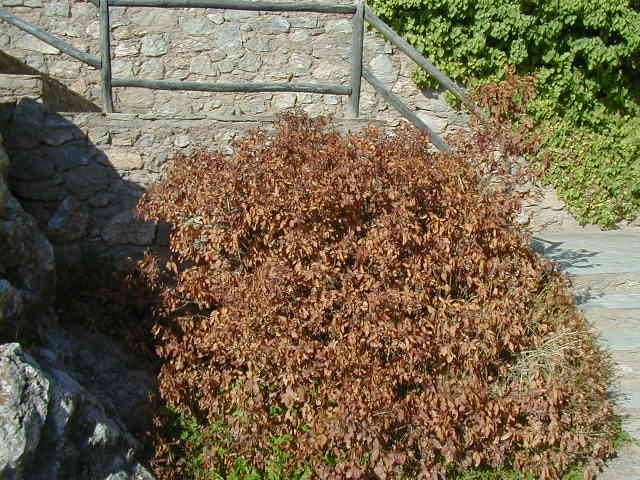 I heard a passing tourist say that she smelled something peculiar near the brown bush near the front of the Temple of Apollo. Remembering that the vent for the toxic gas had not been found, and noting that this was the only dead bush in an otherwise green area, it occurred to me that the toxic, prophetic gas might be rising from the ground near this bush. I decided to give it a try. I stood next to the bush, took a deep breath, and predicted that Al Gore would win the presidential election. Damn those ambiguous prophesies! 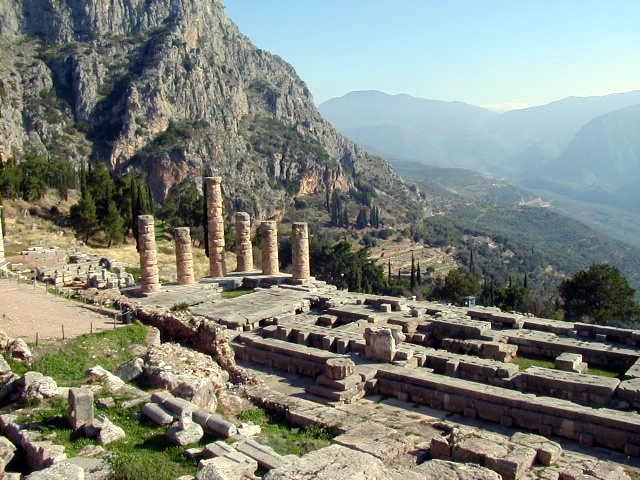 Delphi also had recreational facilities. 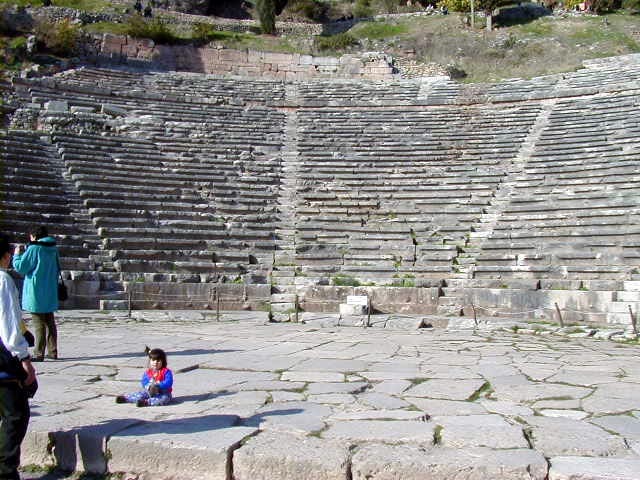 There is a theater, with an aspiring actress preparing for her part. "I'm ready for my close-up Mr. De Mille." 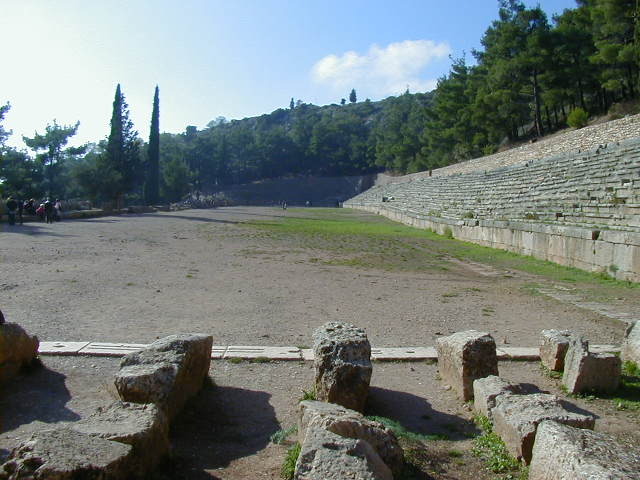 Further up the mountain is the Greek stadium. 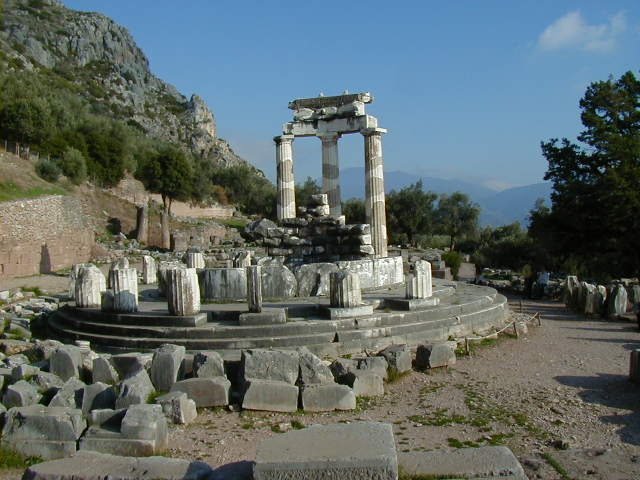 A short walk from Ancient Delphi is the sacred spring that was used for ritual cleansing before going to the oracle. When I reached the entrance to the spring there was a sign posted saying the area was off-limits due to the risk of rock slides. I saw some people entering the area in clear violation of the sign, so of course I went after them. While attempting to do my civic duty and chastise these people (pretty difficult when you don't speak the language) I took a few pictures. Myth has it the water from the spring causes either forgetfulness or remembrance; I can't remember which. 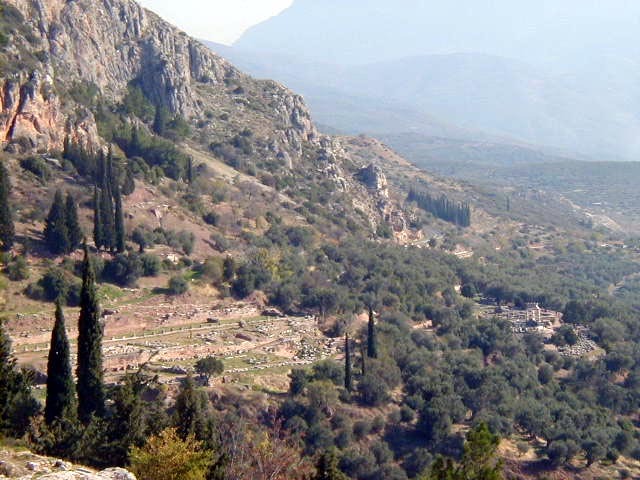 Further down the road, and partially down the mountainside, is the Sanctuary of Athena. 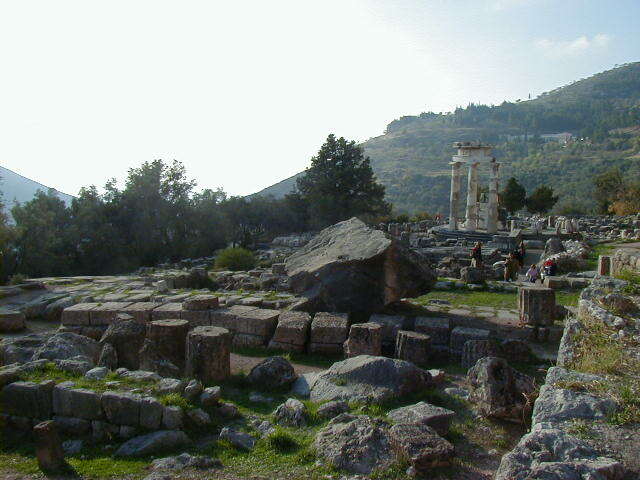 Enough remains to allow one to imagine what it must have looked like when the white marble Tholos and nearby temples were new. 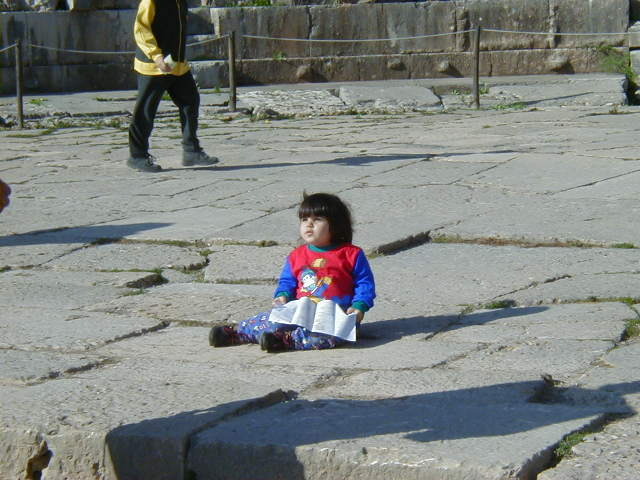 The polished marble under the intense Greek sun must have been blinding. As the boulder in the last picture shows, time and falling rocks have taken their toll. 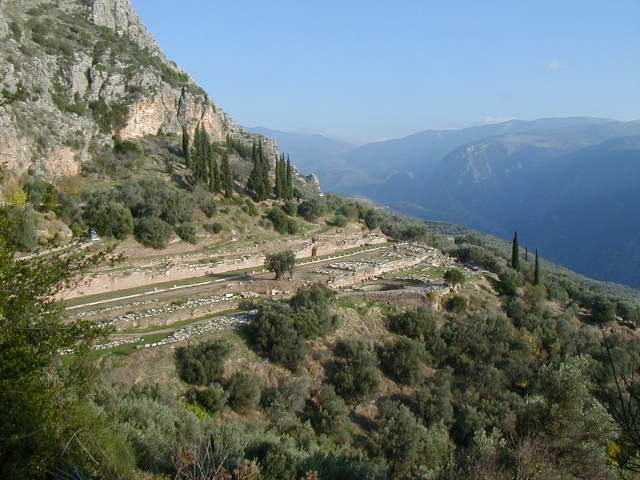 Delphi also has a museum with some of the finds from the site. 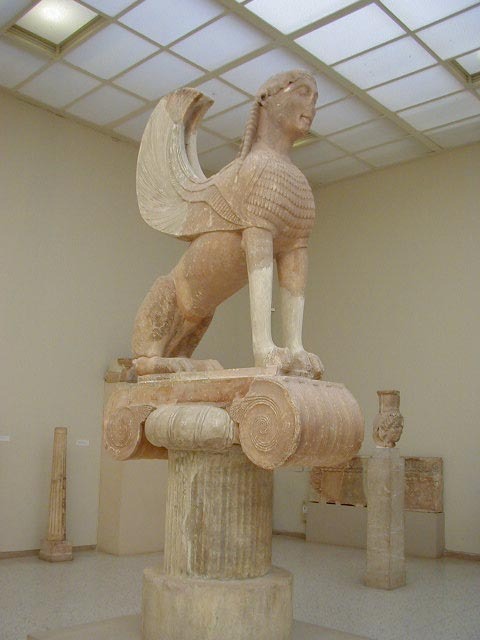 The Sphinx is from 560 B.C. 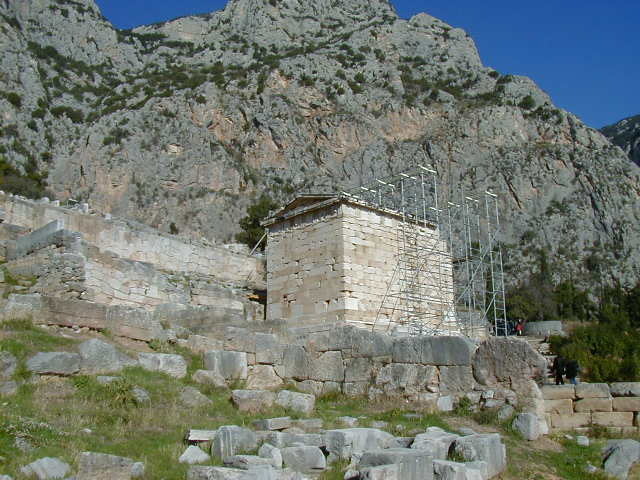 The kouri of Kleobis and Biton, part of the Delphi mythology, are also from the sixth century B.C. 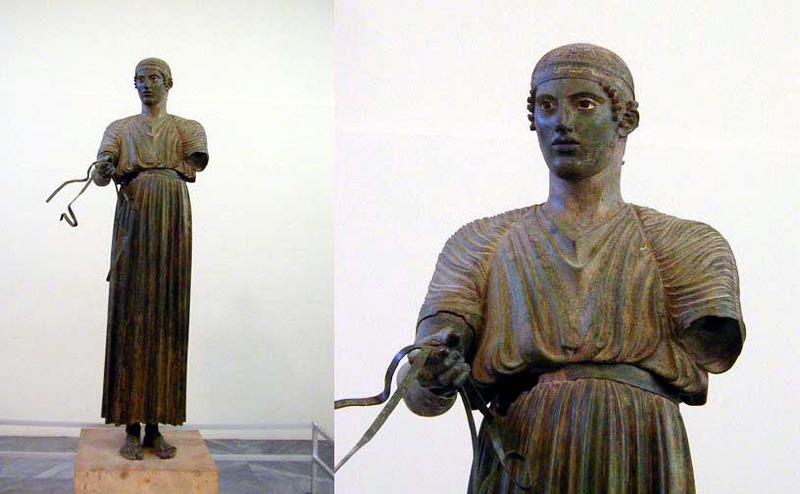 It is interesting to compare the kouri, with the obvious Egyptian influence, with the bronze Charioteer from the fifth century B.C., also in the Delphi museum. 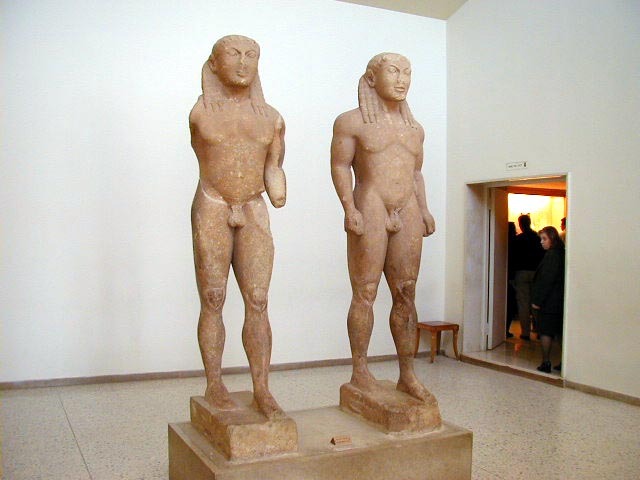 Egyptian art reached a comparatively high level in the third millennium B.C. but progressed little from there. Greek art went far in just one hundred years. 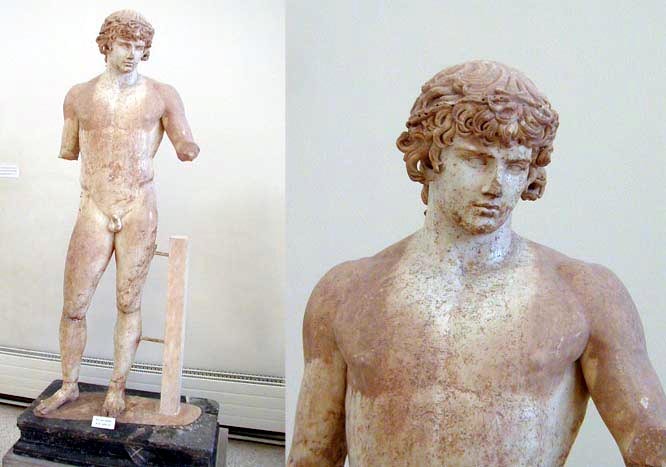 Moving ahead several centuries (the Oracle was popular for a long time) is the Roman era statue of Antinous, the companion of Emperor Hadrian. The Roman's didn't care about Hadrian's relationship with a young man, so long as he did that emperor stuff right. My how times have changed; now whenever a leader drops his pants, the public wants to know when, where, why and with who. 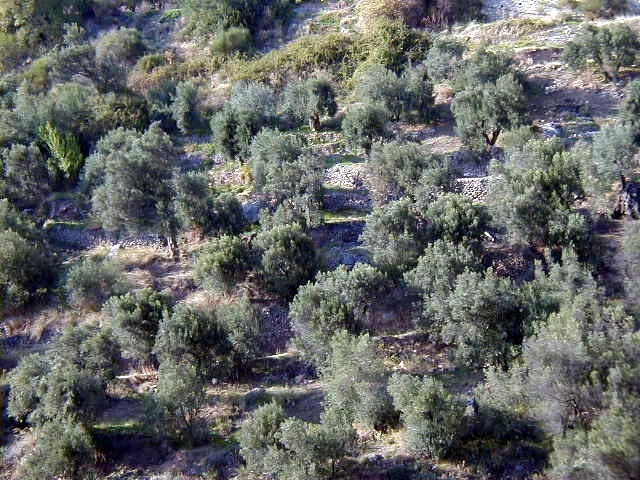 A few shots taken on my way back to new Delphi: First, a terraced grove of olive trees. Olive trees covered every bit of land that could sustain them; I suspect this mountainside has been growing olives for many centuries. 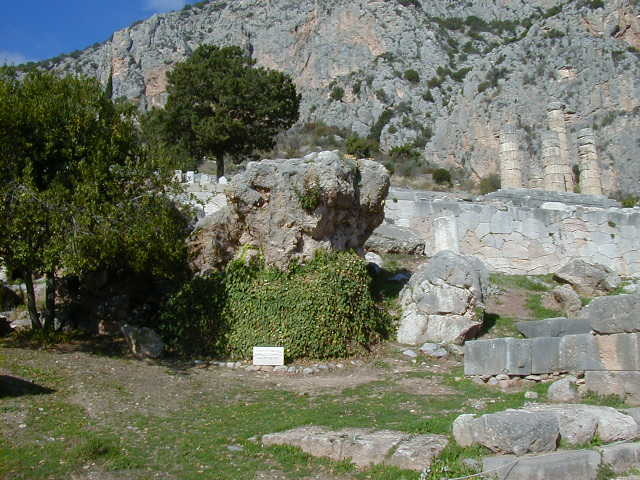 After the olives, a view of the ruins of a gymnasium near the Sanctuary of Athena. Last is something for the "Animal House" fans. I got a kick out of the Greek-Toga thing. I only spent one full day at Delphi. The next morning I took a bus to the port of Patras and caught an overnight ferry to Trieste Italy.